Today I found out that Samuel Clemens was born and died during Halley’s comet years. This is a somewhat uncommon occurrence given that Halley’s comet only passes by the Earth approximately every 76 years. What makes it even more remarkable is that Clemens predicted the year of his death. I came in with Halley’s Comet in 1835. It is coming again next year, and I expect to go out with it. 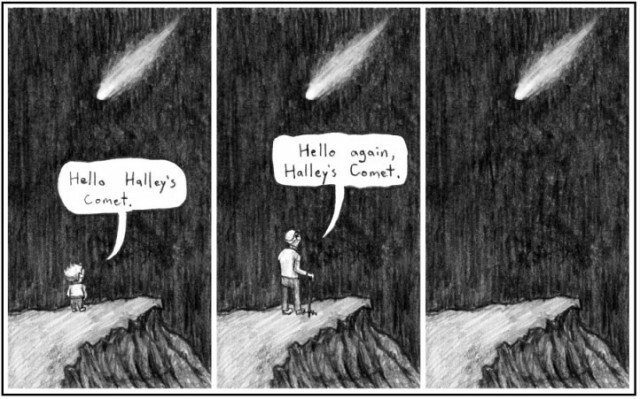 It will be the greatest disappointment of my life if I don’t go out with Halley’s Comet. The Almighty has said, no doubt: ‘Now here are these two unaccountable freaks; they came in together, they must go out together. 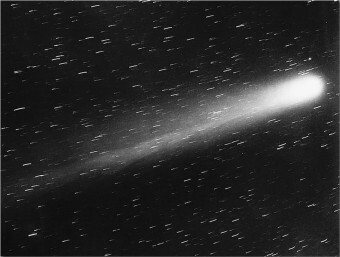 Clemens was indeed born just after Halley’s Comet appeared in 1835, and he died of a heart attack one day after it appeared at its brightest in 1910. While this association, combined with Clemens’ foretelling of his own death, is probably unique, Halley’s Comet has been the subject of a string of predictions since 1705. That was the year that Sir Edmond Halley first realized that comets sighted in 1531, 1607, and 1682 were all the same comet. 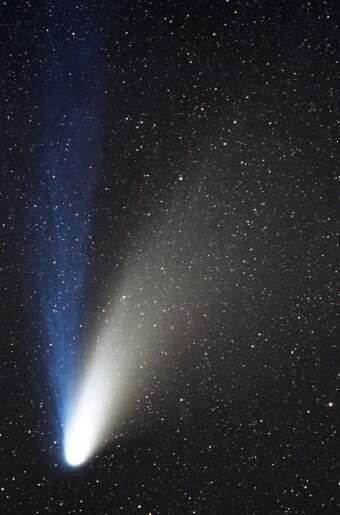 In his A Synopsis of the Astronomy of Comets, Halley stated that the comets all appeared very similar in their orbit and various other parameters. From his conclusion, he calculated that it would reappear in 1758. Halley died before he was able to see his prediction come true. As reliable as ever, the comet appeared late that year and reached perihelion—when it emerged from the far side of the Sun—in 1759. The comet was named “Halley’s Comet” in honour of the man who had discovered its pattern. Because of its orbit, Halley’s Comet always shows up around every 76 years, just as Halley calculated. However, due to the gravitational pull of the planets that it passes, it’s sometimes a year or two off the mark. After the find, scientists began to calculate when Halley’s Comet appeared in the past, while trying to account for the slight deviation. The dates they came up with matched up with a surprising number of recorded comet sightings in history. The oldest commonly accepted date for the first documented reference of Halley’s Comet is 240 B.C., when it was sighted by Chinese astronomers. The passing of the comet was recorded in Shih Chi and Wen Hsien Thung Khao chronicles. However, it’s possible that it could be the comet observed in Greece as far back as 467 B.C., making it the earliest known recorded sighting. Back then, no one thought to keep track of the time between comets to see if one might be recurring. Comets were seen as isolated events and a sort of herald of change or disaster. As Shakespeare wrote in Julius Caesar around 1600: “When beggars die there are no comets seen; The heavens themselves blaze forth the death of princes.” (Interestingly, Halley’s Comet would have passed in Caesar’s lifetime around 87 B.C.—two years before his father died and Caesar became the head of his family). The comet has, in fact, been at the centre of a few historical events. For instance, William the Conqueror took the comet as a good omen when it showed up just before the 1066 invasion of England. 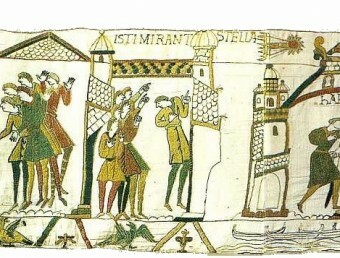 The comet was memorialized on the massive Bayeux Tapestry which was made after the invasion. The tapestry shows people celebrating the crowning of King Harold, terrified of the comet soaring above. Below King Harold is a fleet of ships, hinting at the coming Norman Conquest. You’ve come, have you? … You’ve come, you source of tears to many mothers, you evil. I hate you! It is long since I saw you; but as I see you now you are much more terrible, for I see you brandishing the downfall of my country. I hate you! In 1222, the comet passed by Earth again, heralding similar doom. This time, Genghis Khan started marching west. Apparently, he thought of the comet, which was heading west the same as he did, as his personal star. Of course, the invasion of Europe would leave millions of people dead—not such a great omen for them. Fast forward back to 1910. The death of Clemens was, of course, a sad event for the literary world, but the year could be seen as an omen ushering in a new age on Earth. That year, the first photograph was taken of Halley’s Comet (pictured right) and between that sighting and the next in 1986, mankind would advance technologically in wondrous ways, far more rapidly than at any other known time in our history. Of course, we also waged war among ourselves at a baffling scale a couple times, and even came extremely close to possibly destroying most of the life on Earth. On the flip-side, around the same time we were nearly destroying ourselves- illustrating the need for humans to spread out among the heavens- we took our first steps away from this giant space vessel known as Earth. Further, for one all too brief moment, humanity was united in 1969 as we watched the first human step out onto the surface of the Moon. When Halley’s comet arrived again in 1986, the first observation of the comet from space was made. This turned out to be fortunate, because the view from Earth was very disappointing. In fact, according to a study published in the Royal Astronomical Society of Canada Journal, the 1986 view of the comet was the worst in about 2,000 years. This was compounded by the fact that light pollution made it impossible for many to see it even with binoculars. Unfortunately, NASA itself suffered a tragedy in attempting to view Halley’s Comet from space. Part of the mission of the ill-fated Challenger was to observe the comet, but of course it suffered a rocket malfunction and exploded just minutes after take-off, killing everyone on board. NICE ARTICLE. THE CARTOON STRIP AT THE END WAS THE BEST. MORTALS VS THE GLORIOUS ETERNALS.